Young Lord Penric now wears the white robes of the Bastards Order, complete with shoulder braids marking him as a divine and sorcerer, while he pursues scholarly studies in the court of the Princess-Archdivine. His demon of disorder, Desdemona, is, of course, present, accounted for, and offering clever commentary, particularly when she grows bored. And so when a Locator of the Fathers Order shows up on the Archdivines threshold in need of a sorcerer for a journey and she volunteers Penric, at least Des is thrilled with the prospect of an adventure. As they travel into the mountains to locate Inglis, a shaman accused of murdering his best friend, the situation grows into a test for all of Penrics developing talents. 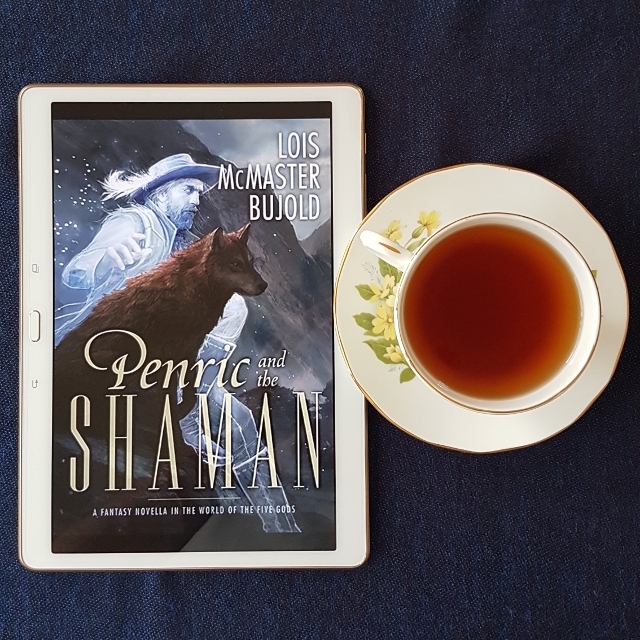 Penric’s Demon was one of my favourite reads last year and so I was delighted to get my hands on a review copy of Penric and the Shaman. As expected, it proved to be a fantastic continuation of the series by one of SFF’s masters. Time has passed since the last book. In the intervening four years, Penric has earned his braids as a full-ranking priest and has settled into a scholarly life. The narrative begins with a little taste of Penric’s current life. It’s quiet but Penric, being a huge nerd, loves it. Desdemona, having been through it all before (more than once), is bored by it. I really enjoyed this look into how their relationship has developed. It is part odd-couple and part parent-and-child, though this latter dynamic shifts over the course of the novella. One of my few quibbles with this book is that while we do get a few more glimpses of their relationship, we don’t get to see all that more of Desdemona. What we get instead is an illustration of what their relationship looks like to outsiders. The story is told in close third-person from three points of view: Penric; Locator Oswyl, who has come to hunt down a shaman; and Inglis, the shaman himself. This enables us to witness what it’s like to be in Penric’s presence, to see the slips in phrasing and intonation when Desdemona takes over. It also shows us how frequently Penric is underestimated, his relative youth and cheery disposition often causing others to think him a fool, even dismiss him. One of the things I loved most about Penric’s Demon was Penric’s kindness and I was pleased to see this remained present. The character is definitely less naive and there were glimpses of the burden he’s under. However, he never treats Desdemona as a burden and is unfailingly respectful to those around him. And even though he is less naive than he was, he still has lessons to learn–lessons that come as a surprise to him. The gods continue to interfere in this world (and in Penric’s life) in ways both direct and indirect, which I very much enjoyed. I also liked the expansion of the world’s magic system and felt it interacted with the dominant religious system in interesting and plausible ways. I found the opening oddly bumpy and the style jarred, but quickly settled down with Penric’s appearance. There was also a bit of info-dumping during Oswyl’s briefing of Penric and the Princess-Archdivine. It made sense in context, but I was on the verge of being lost before it was done. However, on the whole Penric and the Shaman was an absolute delight to read. I’m very much looking forward to the next in the series.